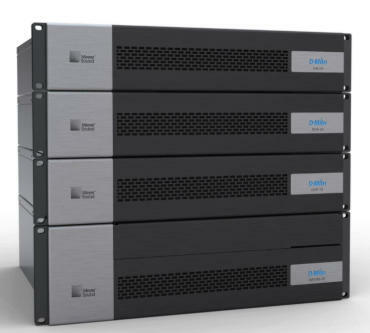 At prolight + sound show 2009, Frankfurt, Meyer Sound announced the D-Mitri digital audio platform which provides the foundation of the company’s LCS audio show control system and Constellation electroacoustic architecture. D-Mitri is a network-based system that encompasses the entire audio chain, from microphone input to loudspeaker output, incorporating multichannel distribution, multichannel recording and playback, and show control automation. Meyer Sound’s LCS audio show control is renowned for capabilities it can achieve by integrating all audio functions in one system. D-Mitri takes these features to the next level, Gigabit networking, enhanced configuration flexibility, as well as precise mixing and routing of matrices up to 576 x 576 channels in size via proprietary computer software, or custom third-party programs, using Open Sound Control (OSC) messages. D-Mitri systems can be tailored to the unique requirements of theme parks, spectacle shows, theatrical productions, museums, planetariums, performing arts centers, stadiums and arenas, and retail environments. D-Mitri comprises network technology utilizing the emerging AVB standard, a family of processing and input/output devices called nodes, high-quality signal processing firmware, and control software. Four analogue I/O nodes provide different combinations of inputs and outputs, with audio A/D and D/A conversion at a 96 kHz sample rate and 24-bit resolution. Two digital I/O nodes offer either AES3 or CobraNet inputs and outputs. The Wild Tracks nodes offer 72 tracks of high-resolution audio recording and playback, while the VRAS nodes integrate D-Mitri into Constellation electroacoustic architecture. D-Mitri utilizes the newest quad-core processor technology and FPGA technology to realize up to 64-bit floating-point internal resolution. Each processor node handles up to 72 inputs and 72 outputs, plus 72 bus channels, with every stage providing eight bands of EQ, two bands of dynamics, and delay. A dedicated mix engine serves systems having more than 72 input or output channels in a single cohesive matrix. D-Mitri’s multichannel audio is transmitted via the AVB (Audio Video Bridging) standard, a widely adopted networking protocol designed to be a true real-time system, in which all network devices respond to a control or command at the same time. D-Mitri supports two separate AVB networks that can operate in parallel for fail-safe redundancy. AVB networks will ultimately use standard, off-the-shelf Ethernet routing and switching equipment. D-Mitri’s modular concept and open control architecture allow for exceptional flexibility in configuring systems for specialized applications. In addition to OSC compatibility, a dedicated GPIO node provides connections for MIDI, RS232, RS422, SMPTE time code, contact closure, and world clock in/out. Meyer Sound D-Mitri was also showcased at PALME Dubai and will begin shipping in fall 2009.